Both edges of the ring are decorated with a simple twist for an understated embellishment. 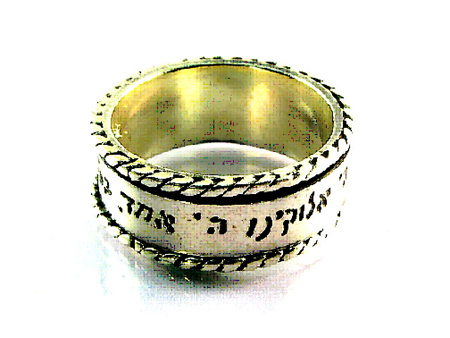 Jewish jewelry always makes a great souvenir of Israel or a present. Wear this ring yourself or give it to a loved one. Either way, the Shema Israel - long believed to provide protection - is at your fingertips. Emunah Jewelry designs and produces all the pieces in its collection in a studio on Moshav Shoeva in the foothills of Jerusalem. Emunah strives to create jewelry that features original design and fine craftsmanship. Motifs focus on Jewish themes. All of Emunah's jewelry uses the best materials available - 925 sterling silver, 9/14/18 karat gold, pewter, and precious and semiprecious stones. Each piece is stamped with the company's ID to ensure quality and prevent imitations. All Emunah jewelry comes with a warrantee.